Janod Story Box Firefighters lets volunteer to join the fire brigade. 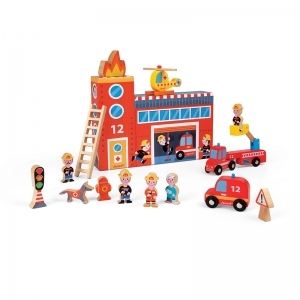 Designed in France, this 15 piece playset with fun wooden pieces is shaped and painted as a rescue copter, 2 piece hook and ladder, ambulance, 4 fire fighters, an injured boy, a rescue dog, fire hydrant, ladder, traffic light, road sign and flames, so you'll be saving lives in no time! 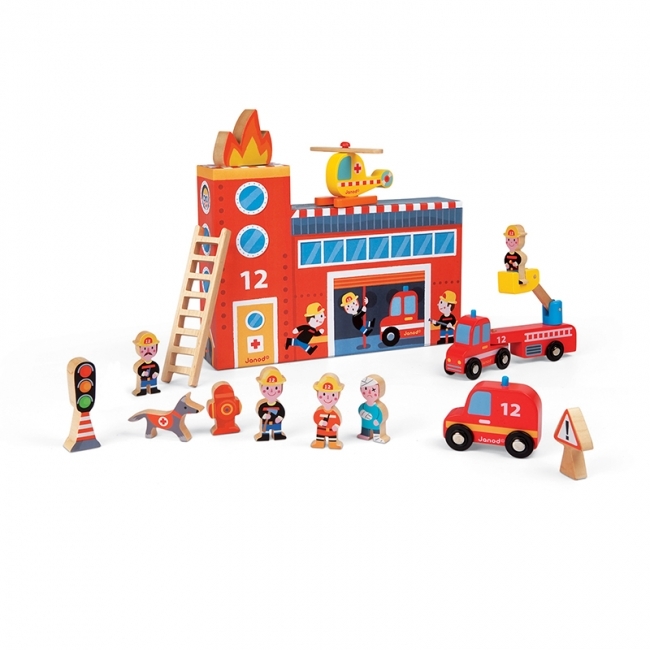 The box is designed to be used during play as well, mimicking the look of a fire station. With Janod's Story Box Firefighters, the playtime possibilities are endless. Recommended for children 3 years of age and older. Janod Story Box Farm gets you ready for a solid day of work and play. Open the sturdy cardboard box, which is also your farmhouse and barn, and you'll find everything you need to have dairy land fun. 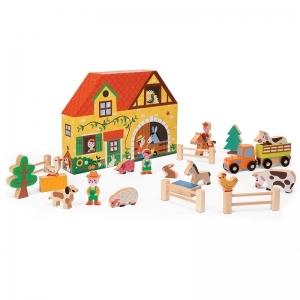 Place your farmhouse, tree, haystack, water trough and 4 fences. 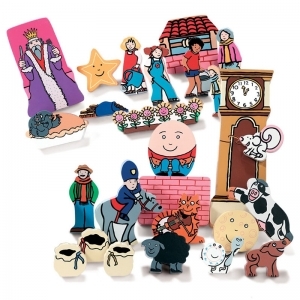 Then it's safe to let loose the animals; there's a duck, sheep, dog, pig, bunny, donkey, horse, chicken and 2 cows! When it's time to round them all up, the farmer, his wife and farmhand are ready to work. There's also a magnetic tractor and trailer to transport the animals. All pieces are made of beautifully painted wood to spark a young one's imagination! It's a great to play with on its own and also makes a wonderful addition to a wooden train village! Recommended for children 3 years of age and older.